Thanks for requesting the digital version of the Turbo Medic Highlights CD. 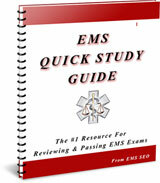 Pleas check your email for a message you must confirm in order to get this free study resource. This is done to make sure it was you that requested it and protects us both from Spam, phishing and other unsavory things. While you wait for this email I have a great item I know you will find useful especially if you like the highlights of things. Well, you know that huge EMS textbook you have? Here is a resource that condenses it into about 100 pages. Here are all the details and the best part is that I am offering it to you at a special discount just because you signed up for the Turbo Medic Highlights offer. Just use discount code “highlight” when checking out to get $5 off the regular price. This guide is the “meat and potatoes” of any EMS course. It is perfect to review before an exam or as a quick overview of terms or subjects you may be having troubles with. Giving you the “one stop” resource on all the HOT topics found on State and National exams. Haven’t you ever wanted the basics of what will be on an exam without having to skim through your 500 page text book? Major body systems, organs etc. You get all the best parts of your textbook all in one small publication. But it doesn’t just cover a basic overview. It was designed to cover the major parts of what state and national exams test on.